Get your complimentary white paper now! 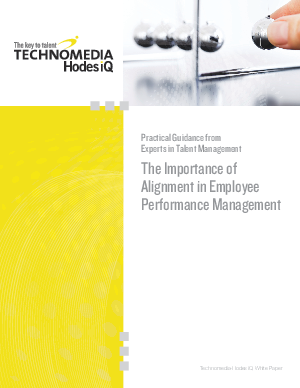 The Importance of Alignment in Employee Performance Management examines the critical relationship between goal alignment and employee performance and their impact on business initiatives. A popular mantra of recent times is that you cannot manage what you cannot measure. While true, this saying isn't exclusively the secret ingredient for organizational success. Merely measuring outcomes lacks the necessary dimension to move organizations towards their desired goals in the first place. Before performance metrics and business analytics are established, an organization must first examine the critical relationship between goal alignment and employee performance management. Download this whitepaper to better understand the components involved in creating a performance-driven culture and how they are ultimately connected to your organization's strategic priorities and talent management initiatives.